spending overtime, cheak out the polarkrafts also, very comparable to tracker as far as price but better quality. I have had trackers, starcrafts, grummans, a boston whaler, and polarkrafts. If you are looking at new and don't want to break the bank, look at the polarkrafts, I got one and for the same comparable models of starcraft, lund, and crestliner I got a slightly longer and wide boat with a yamaha 4 stroke motor for 5-10 grand less. I have had it now for three years I fish perch, walleye, salmon, and bass out of it, tow the kids on the tube and skis. and have had no problems. best boat I have owned. 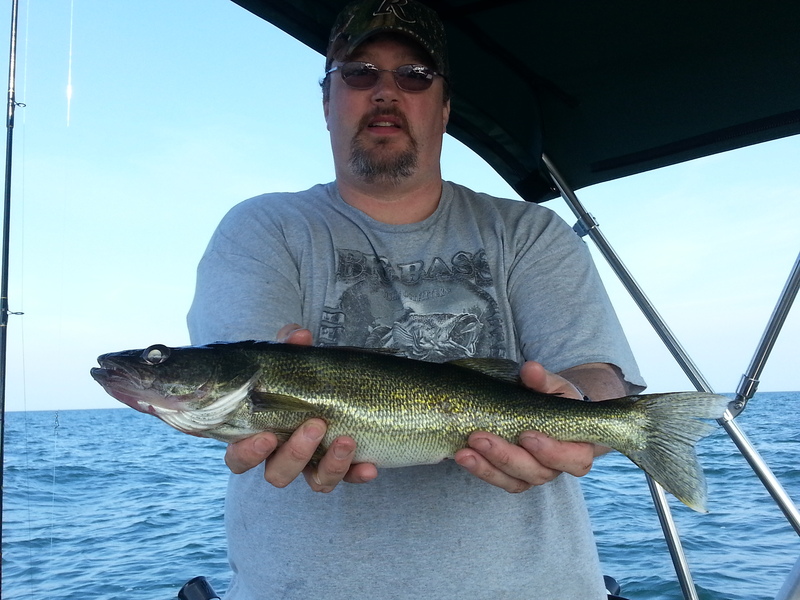 I use my downriggers in onida lake fishing for walleye in 15ft of water, I use stick baits that only dive 5 ft so I put the downrigger at 7 ft to get 12ft and I usally catch my limit. I also use blacks releases. it dose affects launching your boat , I was down in niagria for the loc. and every dock at most of the launches are at least a foot underwater. some are closed all along the ontario shore line. It also depends on what type of fishing you are doing, salmon really aren't affected, but bass are (last year conesus was 5ft low), I wouldn't think that walleyes are affected. I live in Spencerport, glad to see another person from Rochester on the board. Welcome. my dad fishes pa and ohio all the time with harnesses, plugs and spoons. everything has a time and a place, I fish ny with all three depending on the time of year and what they are hitting at that time. Is my boat big enough for Lake Erie? Big motor on...Bow-mounted trolling motor on? I have a minn kota ulterra that has i pilot and what I do it turn my motor on and set up the auto pilot but I leave the motor off (0 power), when I hook up with a fish I put my trolling motor(main motor) to idle and turn the motor in the front to 8 power and set the direction, when I get the fish in and the rods reset. I shut the trolling motor off and reset my main motor to it trolling speed. I tried to run it where it was running all the time but it ran out of power 3 hours in. During the loc I will fish up to 10 hours at a time. and doing my way you can do it for 20+ hours without having to charge it. I works great up to 3 foot waves, then as long as you are not going directly into them you are still good (may need to turn up the power to 10) also do not use the advanced auto pilot, use the standard one. I had the same problem this winter in deciding on a temp probe, but with the fact that the smart troll was $$$$ and the fish hawk has been around a long time I went with the fish hawk. I don't like the idea of having a expensive proble on my line I would rather have it on my downrigger cable that is more reliable. I also found a deal for them at Northwoods Wholesale Outlet Inc. but it dose not look like they carry them anymore. plasti dip in spray can form, works great. Its crazy that they even let them on the water after dark. ( iv'e seen the sheriffs boat pull over skiers when its starting to get to dark on conesus) of course I think their crazy to be out on Ontario or Erie on one of these things to begin with.